Loch Mullardoch in the Western Highlands is encircled by high mountains and long ridges. Tucked away in a remote area, with only a narrow single track road reaching the dam at the eastern end of the loch through Glen Cannich, there is a real sense of remoteness in this area. We're here for 2 days of guided hiking to reach high Munro summits including Sgurr na Lapaich, Beinn Fhionnlaidh and mighty Carn Eighe. With no roads or tracks along Loch Mullardoch's shores, bagging the peaks requires a fair bit of effort and planning - we'll be taking a boat along the loch to ease us into our hillwalking on each day. 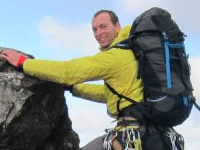 2 days guided hiking over high mountains in the north-west of Scotland. By boat, sail along Loch Mullardoch to reach the heart of the area. Explore ridges to reach superb vantage points from where stunning views can be appreciated. 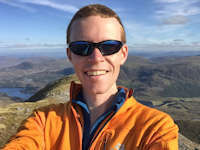 Bag 9 Munros in the area, including the mighty mountains of Sgurr na Lapaich, Mam Sodhail and Carn Eighe above their many corries and lochans. 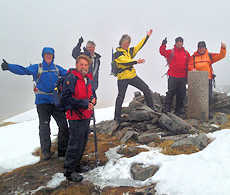 This 2 day event is a guided hiking holiday with one of our experienced and qualified leaders. 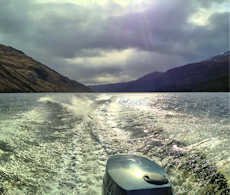 Both days begin with a boat journey along Loch Mullardoch, the cost of which is included. You would be very welcome to join us for part of the trip, the cost of which is £99 per day. 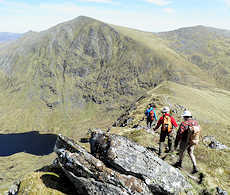 A day bagging 4 Munros while hiking on high mountain crests with superb views. These 4 remote Munros form a linear chain rising high above Loch Mullardoch and Loch Monar. With no roads or tracks along Loch Mullardoch, a boat along the loch is a fine way to reach the start of a fine day's hiking. On our first day we'll take a boat from Mullardoch Dam along the loch. Then on foot, we'll aim up a faint path through grass and rush and towards An Socach. 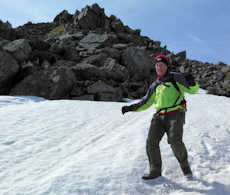 Terrain gets easier as we ascend this mountain's southern spur and gain the summit crest. Beyond this, we'll aim for the windy col to the east of An Socach and continue eastwards along fine ridges and over the vast plateau of An Riabhachan. Up mighty Sgurr na Lapaich and over the more gentle Carn nan Gobhar we'll turn south and pick up a track back to the dam. 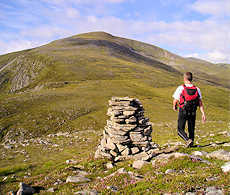 The mountains to the south of Loch Mullardoch are rougher than those to the north and have no obvious pathed routes accessing from Loch Mullardoch. Mam Sodhail and Carn Eighe are the highest mountains to the west of the Great Glen and as such afford great views in all directions. Starting with a boat along Loch Mullardoch as in the previous day, this time we'll be dropped of at the foot of Beinn Fhionnlaidh. From there we'll strike directly uphill and onto Beinn Fhionnlaidh southern shoulder. 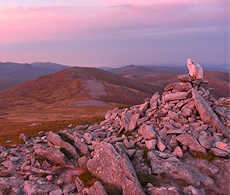 A relaxed walk over grassy ground leads to the summit and superb views. We've a fair haul to get to the col between Mam Sodhail and Carn Eighe, and some steep ground to ascent to reach Mam Sodhail's huge cairn. An about-turn leads us over Carn Eighe followed by some fun twisting between the pinnacles on Stob Coire Dhomnhuill. Over Tom a'Choinnich and Toll Creagach, we then have a grass and heathery descent back to the dam. The varied routes have faint paths lower down with generally grassy slopes leading to rougher terrain higher up. Our first day is classed as 'Demanding' and the second day is longer so classed 'Demanding with long distance'. Leading the event on 19-20 June'19. Also leading the event on 19-20 June'19. Leading the event on 4-5 July'19. Cannich is the most ideally located base for accommodation and food for this event. Cannich is located on the A831 12 miles west of Drumnadrochit on Loch Ness and 16 miles south west of Beauly. There is a regular bus service from these towns and from Inverness (see Ross's Transport and Stagecoach for more info). We may be able to help with transport from Cannich to Mullardoch Dam if needed.